20% – 75% off Selected Items. Thank a Healthcare Professional today. Watch the video below on Healthcare Appreciation Month – May! What better way to say Thank You to all our health care providers than to pass some amazing savings to our loyal customers! 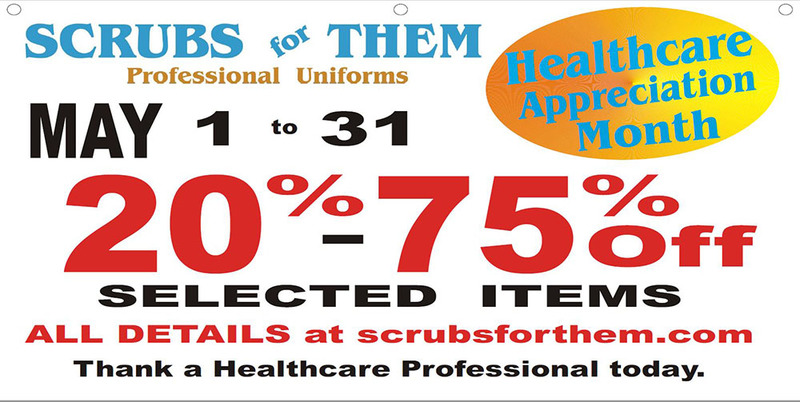 Come in to Scrubs For Them and see what amazing deals we have going on this week! This includes 20% OFF all regular priced Cherokee and Dickies! For all our “future chefs in the making”, enjoy 20% off our Hatley kids aprons! For all our currently “Masters of the Kitchen”, come in and enjoy 20% off all chef wear! Way more savings in store! From all the staff at Scrubs For Them, thank you for what you do! Can’t wait for it to be open. Do you have any ideas when? Thank’s and have a nice day gang !!! Thank you for your comment, have a great weekend!